Held in Sydney at est. 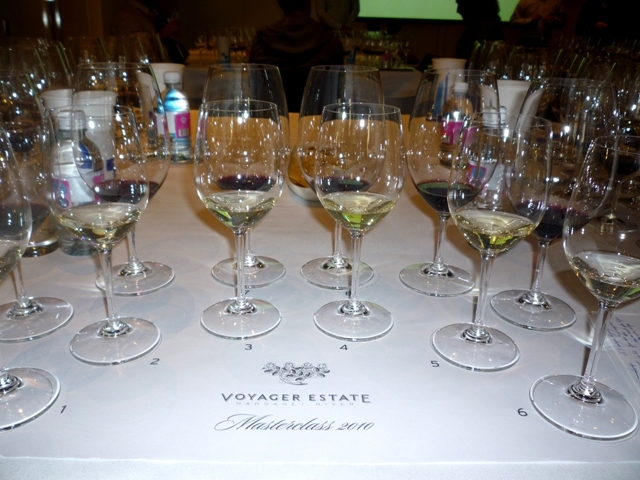 (as well as other places in Australia), this masterclass provided the experience of top benchmarking wines all in one setting, including Voyager Estate from Margaret River. The international benchmarking tasting explored special sites around the world that are acclaimed for producing iconic Chardonnay, Shiraz and Cabernet Sauvignon predominant wines. Hosted by Voyager Estate’s manager of winemaking and viticulture, Steve James and winemaker Travis Lemm, it was interesting to see how all wines presented individually distinct character from different wine sites. There were many great wines tasted including the top French, Italian and USA examples but I would like to provide a quick snapshot of the Australian/NZ wines included for your interest… All these wines have good ageing potential for their variety. Craggy Range Les Beaux Cailloux Chardonnay 2007 – from Hawkes Bay in New Zealand, great for Chardonnay. This is from the Gimblett Gravels vineyard (known as great vineyards for Bordeaux-style reds and Syrah from new Zealand), giving a prominent minerality that lasts through to the finish. Rrp around $60. Leeuwin Estate ‘Art Series’ Chardonnay 2007 – From Margaret River (WA), and one of the most iconic examples of Chardonnay in Australia, this wine shows a citrus fragrance, with a powerful palate of white stone fruit and grapefruit, linear acidity and a hint of oak. The length is long and smooth. Great collector item. Rrp around $95. Voyager Estate Chardonnay 2007 – Also from Margaret River. Good body, stone fruit, melon and fresh acidity and a hint of nuttiness. Great length. Rrp around $40. Clonakilla Shiraz Viognier 2008 – One of my favourite wines. Premium example from Canberra, and of the Shiraz and Viognier blend in Australia. Young, fragrant red fruits and floral notes, with some earthy characters that give the wine depth. Palate is intense and further shows its depth, with plenty of opulent fruits and smooth silky tannins, in a length and structure that demands attention. Aged in French oak which re-assures the elegance of this wine. One of the top collected wines in Australia. Can cellar for about 15+ years (from vintage year) 🙂 Rrp around $95. Dalwhinnie Moonambel Shiraz 2008 – Also a collectible, from Pyrenees (Vic). An attractive wine perfumed with dark spices and earthy characters, blackberries and black cherries. Palate provides plenty of juicy fruit accompanied with great texture through well integrated tannins and oak. Superb length that leaves you very satisfied. Cellar for about 15+ years. 🙂 Rrp around $60. Shaw & Smith Adelaide Hills Shiraz 2008 – South Australia. Attractive Shiraz with warmth, spices, ripeness and well integrated oak. Rrp around $38. Balnaves The Tally Reserve Cabernet Sauvignon 2005 – Coonawarra (SA). Intense wine with cassis, ripe currants, dark spices (think licorice and pepper), in a very firm structure. Rrp around $80. Cullen Diana Madeline 2005 – Margaret River (WA). A top biodynamic example and cabernet blend – Cabernet Sauvignon, Merlot, Malbec, Cabernet Franc and a dash of Petit Verdot. Great depth, with intense ripe fruit, savouriness, black cherries, smooth tannins and well integrated oak. Persistent and elegant finish. Cellar for about 12+ years. 🙂 Rrp around $90. Mount Mary Quintet 2005 – From Yarra Valley (Vic). Another superb Bordeaux/French blend of Cabernet Sauvignon, Merlot, Cabernet Franc, Malbec and Petit Verdot. Displays both ripe red and black fruits adding fruity and savoury tones to the nose and palate. Silky tannins and fruit are well rounded in an elegant style and very long finish. Cellar for about 15 years. 🙂 Rrp around $100. Voyager Estate Cabernet Sauvignon Merlot 2005 – Margaret River does many fine examples of Cabernet and Merlot blends, and Voyager estate is among the top of these. Both red and black fruits are displayed in rich flavour, along with well integrated tannins and oak, all in balance and a long and solid but smooth finish. Cellars for about 20 years… Rrp around $60.